Author Mark A. MorinPosted on August 22, 2016 Categories PersonalLeave a comment on Roomans — H.A.W.K.S. I completed another project that I needed for my game War Must Be. In the game, there are General Spells. 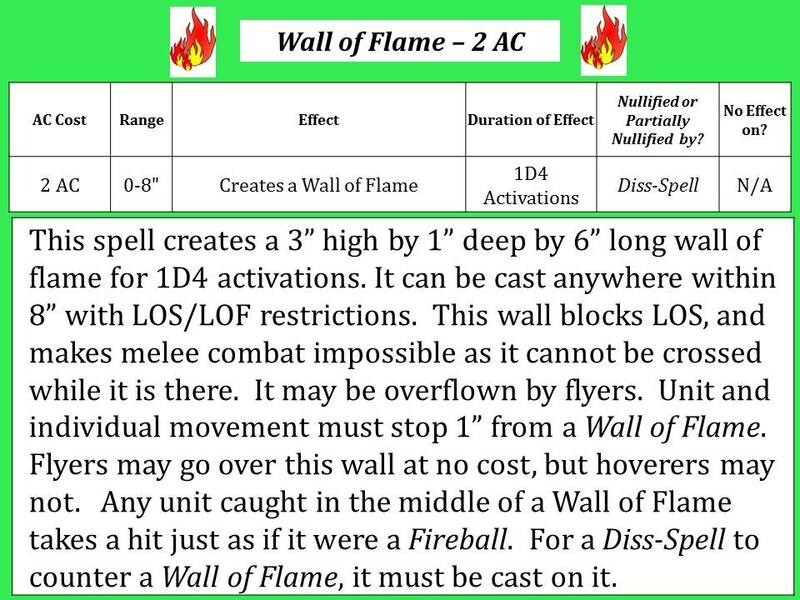 Among these spells is Wall of Flame. 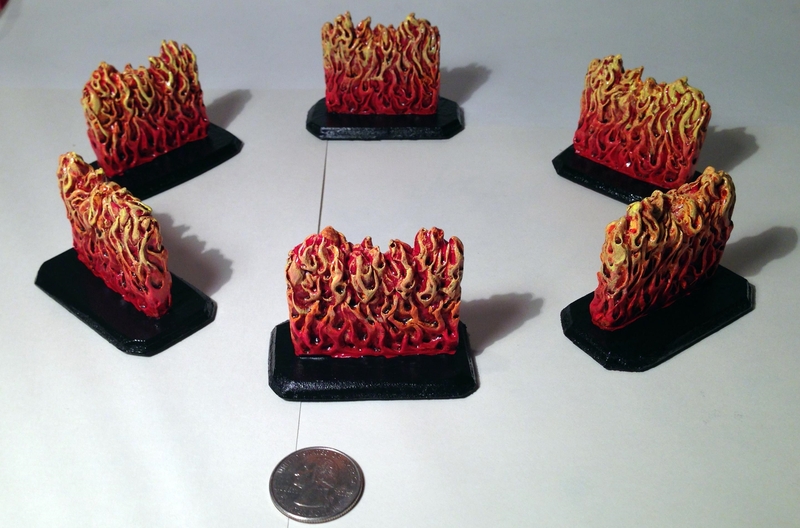 Luckily, I found a listing at Noble Knight Games (or possibly on their eBay site) for 6 Ziterdes Fire Walls that would serve my purposes well. They were resin (not metal). Ziterdes makes very high quality German hobby products, and Noble Knight games has many of them for sale. I soaked them in dish soap and cleaned them with a toothbrush (something I learned from Chris Palmer – thank you Chris!). 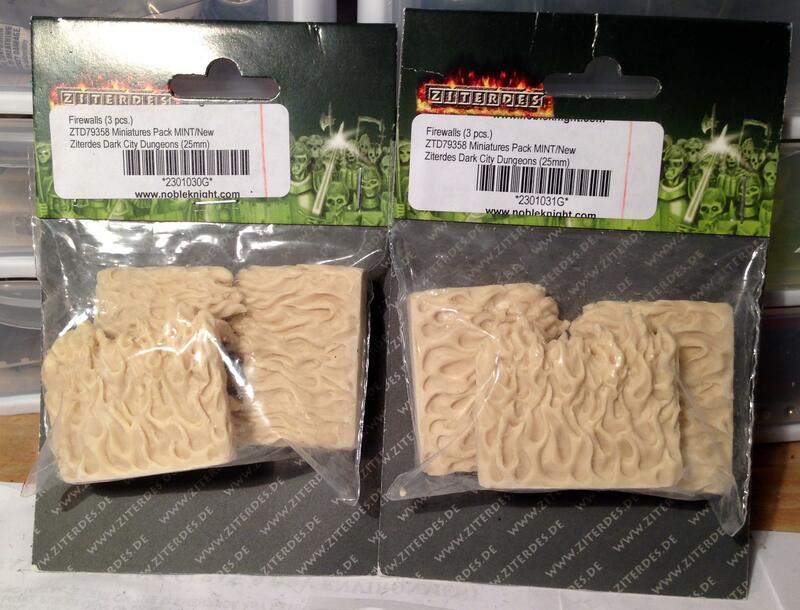 I had cut several bases out of 1/8″ plywood with my scroll saw so I used these for mounting the Walls of Flame. I also mounted two 1″ steel washers to the underside of each base for magnetic attachment in my storage boxes. I painted the bases with Americana “Jungle Green”. Then, I used up the last of my Armory “Red” from 1996 to base coat the walls. I had wanted to use my Armory “Scarlet” as well but that had become unusable after 20 years! After that dried, I then applied Americana “Primary Red”, followed later by a wash with Secret Weapons Washes “Ruby”. After that I highlighted the walls with Citadel “Wild Rider Red”. I thought it appropriate to use some of my German 1986 Deka-Lak “Gelb” (Yellow) for flame highlights with a drybrushing technique (after all these are a German product). For the middle part of the flames, I used Tamiya “Orange X-6”. Then I washed them sequentially with Secret Weapons Washes “Just Red” and “Ruby”, allowing both to dry in between. I thought the bottom of the flames needed a deeper red, so I went back to using Americana “Simply Red” as a highlight at the lower end of the flames. I second-guessed my use of green for the bases. 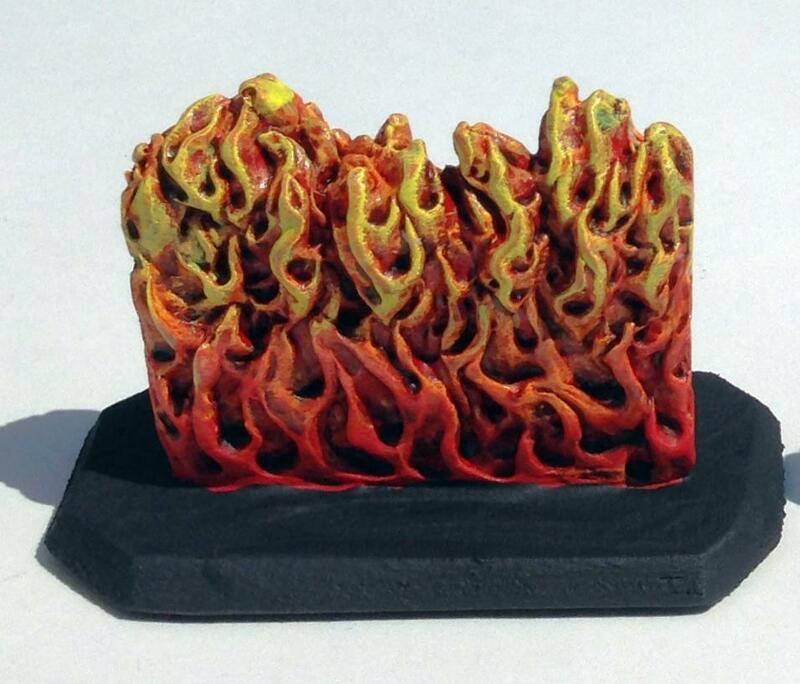 Would not all the organic material at the base of a Wall of Flame be burned? Therefore, I went with Americana “Ebony/Lamp Black”. For varnishing, I went with Krylon “Clear Glossy” as I wanted the walls to be as bright as possible. I am very happy with how these came out. They really “pop”! I will use them as walls of flame, and also potentially as fireballs for my wizards, discharges from flame weapons and even as breaths of flames for dragons. My Fire Breathing Salamanders will use them as well! I am behind on my blogging as I have been a little under the weather and, ahem, I cannot sit down without pain! So blogging is a bit challenging! The good news (if any) is standing is fine and I have completed a few projects that I’d like to document. I have made Spell Cards for my fantasy miniatures war game War Must Be. Among the Spell Cards is a Mundane Spell called Buzz that enables a Wizard to summon a swarm once per game. Hence, I needed some swarms! The swarms that I found on eBay are below. I don’t think that they were made unpainted but I am unsure. In the front row, I have two grub swarms (Wizkids), and in the back row there are left to right a rat swarm (Wizkids), two monkey swarms (Wizkids), and a Reaper Vermin black widow spider swarm. I painted the grub swarms with Citadel’s Dryad Bark and applied a wash with Citadel’s Agrax Earthshade to each. I also applied the same wash to the others. Each swarm got an appropriately sized washer glued to its underside so as to be easily stored in my magnetically-lined storage boxes. In the end it is irrelevant which type of swarm is summoned as they all have similar effects in the game. Author Mark A. MorinPosted on August 21, 2016 Categories Miniatures & GamingLeave a comment on Swarms!